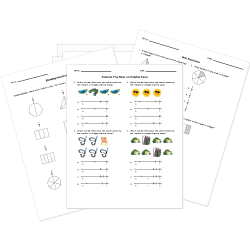 Our fractions worksheets combine visual fraction models, number lines, and word problems to support your math teaching needs and develop student fraction understanding and proficiency. Don't see a printable you need? Use our Test Maker™ to create your own printable that fits your needs. Browse fractions questions or use our advanced search to find existing questions while filtering by grade levels and keywords.